Petunia are half hardy annuals that reach from 30 to 45 cm (12 to 18 inches) in height. 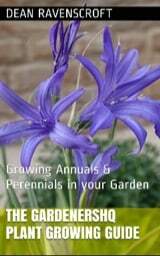 This makes them ideal plants for borders and edging. Petunia flower with trumpet like flowers of many different colours (red, white, bicoloured, yellow, purple) and the plants bloom from the latter half of spring until the first frost of winter. Petunia in bloom by Swami Stream. In-depth advice on how to grow Petunia hybrida. Common Names: Petunia: Grandiflora; Hedgiflora; Multiflora; Milliflora. Scientific Name: Petunia axillaris; P. exserta; P. integrifolia; P. parviflora; P. Supertunia; P. variabilis. Cultivers: Carpet; Caschamp; Charlie's Angels; Conblue; Constraw; Dancasye; Keilavbu; Mirage; Happy Dream; Hybrida; Shihi Brilliant; Storm Lavender; Storm Pink; Suntosol. Flowers: End of spring through to the first frost. Flower Details: Purple, red, blue, white, yellow. Often has two colours. Trumpets. Fragrant. Sow Outside: Surface. Following the last frost. Spacing 3 to 10 inches (8 to 20 cm). Sow Inside: Germination time: one to three weeks. Temperature 70 to 80°F (21 to 27°C). Two months in advance. Transplant outdoors following the last frost. Requirements: Full sunlight or light shade. Good drainage. Soil pH 6 to 7. Organic soil. Moist soil. Regular watering. Pinch tips. Supply a feed once established. Deadhead. Cut back leggy plants. Cut back to half size in the summer. Petunia seeds should be sown outdoors on the soil surface after the last frost of spring. Petunias should be grown in an area of the garden that is sunny or partially shaded, and thrive in a moist soil. 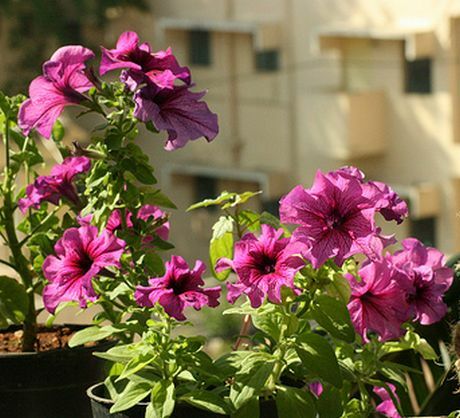 Ideally the soil that Petunia grows in should have organic matter added at the time of sowing, and be of pH 6 to 7.5. You may prefer to start off Petunias indoors (this is strongly recommended for hybrids). They should be started about ten weeks before they are due to be transplanted in the garden (after the last frost of spring). It usually takes one to three weeks for plants to germinate at a temperature of 21 to 27 degrees centigrade (70 to 80°F) in the light. Once ready the Petunia seedlings should be spaced about 20 to 25 cm (8 to 10 inches) apart. Once the young Petunia plants are growing healthily outdoors pinch back the tips; this will encourage branching and result in a bushier plant. Petunias like to grow in moist ground so keep well watered. Once flourishing feed with a fertilizer, repeat about a month later. It is best to deadhead the flowers and tidy up once they have finished flowering. Towards the end of summer cut the whole plant back by about half; this may result in a second bloom. 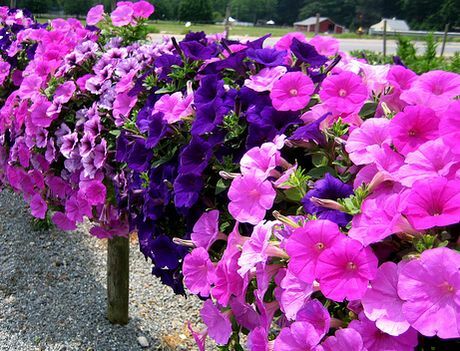 Most of the Petunias that have colored flowers carry recessive genes, so if you require more plants it is best to grow them from purchased seeds. Alternatively allow to self (this will produce mainly white flowered Petunia plants, but some should be the same as the parent).